HER late father was one of Malaysia’s most prominent businessmen and a self-made millionaire. He was a low-profile entrepreneur that founded the Naza Group in 1975, starting his automobile business with an allocation of Approved Permits (APs) to import foreign cars. Tan Sri SM Nasimuddin SM Amin built his empire on industries such as cigarette distribution, credit and leasing, engineering, hotels, insurance, machine tools and parts, manufacturing, motorcycles, property, transport services, plantations and water craft. In 2008, the automotive tycoon ventured into the food business by launching the Bubba Gump Shrimp Co Restaurant and Market under the NZ Diners Sdn Bhd banner. NZ Diners is now helmed by his youngest daughter from his first marriage, Nur Nadia SM Nasimuddin. 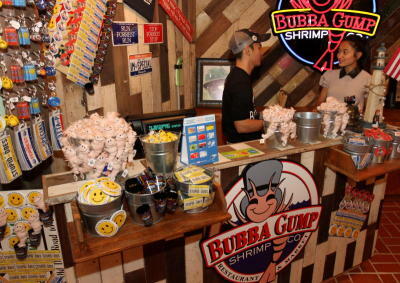 Inspired by the 1994 film Forrest Gump, Bubba Gump Shrimp Co Restaurant and Market is a seafood restaurant chain launched in the United States in 1996. The rose among the thorns, Nur Nadia had big shoes to fill after the passing of her father. Her brothers Datuk Wira SM Faisal, SM Nasaruddin and SM Faliq moved into managing the family business and quickly established themselves as leading men in the industry. At work: Nur Nadia (right) is passionate about her work at Bubba Gump. 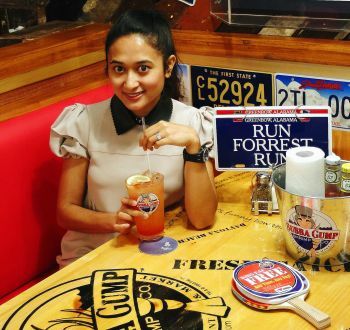 Nur Nadia who, recently tied the knot with a hotelier, was instrumental in launching Bubba Gump in Malaysia. “The idea came about in 2007 as we wanted to beef up our food and beverage division, but it was not until 2008 that we launched the first Bubba Gump restaurant at The Curve with an initial investment of RM5.4mil,” said Nur Nadia who is currently the director of Naza’s F&B division. And within a year, a second outlet that covered approximately 9,000 sq ft was opened in Sunway Pyramid with an investment of RM3.5mil. However, the late SM Nasimuddin was unable to see the success of his F&B division as he passed after losing his fight with lung cancer in May 2008, at the age of 53, one month after the launch of the restaurant. Nur Nadia said the secret to the success of Bubba Gump was in its food and service. “We listen to our customers. We want to know that they have to say about our staff, our dishes and their experience at our outlets. We take all feedback and strive to improve,” she added. After launching its third outlet at Citta Mall, Petaling Jaya, earlier this month, Nur Nadia said the new outlet is expected to contribute 42% to revenue growth within the next six months. Nur Nadia: Eating out has become part of Malaysian culture and it is a great way for the family to bond. Naza Group’s F&B division will also invest RM15mil within the next three to five years for new outlets to be opened around Kuala Lumpur’s Golden Triangle and at Platinum Park, the group’s latest mixed-use development near the Petronas Twin Towers. Even though the first outlet was opened during the 2008 global financial crisis, the restaurant was an immediate hit and wasn’t affected by the financial turmoil, said Nur Nadia. With positive market growth on the horizon, the group plans to open two more outlets within the next three years. Besides Bubba Gump, NZ Diners also recently ventured into the Japanese BBQ grill market with the introduction of Gyu-Kaku in 1Utama shopping centre last month. With more than 700 locations worldwide, Gyu-Kaku is quickly becoming a popular eatery globally. “There is a void in the market for halal Japanese grills and we want to capitalise on that with the introduction of Gyu-Kaku,” said Nur Nadia. The graduate from David Game College and the University of Nottingham in the UK said NZ Diners is planning to develop its own concept for restaurants thatwill be launched at Platinum Park. “Platinum Park is strategically located close to KLCC and other tourist hotspots. And with this being our own development, we would be able to develop our own creative concept for our restaurants,” Nadia explained. The close-knit family has a unique way of ensuring customer satisfaction. Nur Nadia said she eats at least once a week in any of the Bubba Gump outlets with her family to check on the quality of dishes and service. With the Naza pedigree embedded in her DNA, one can only wonder what more can this pint size, youngest daughter of SM Nasimuddin can achieve. She has proved that she is her late father’s daughter by running a successful business on her own.